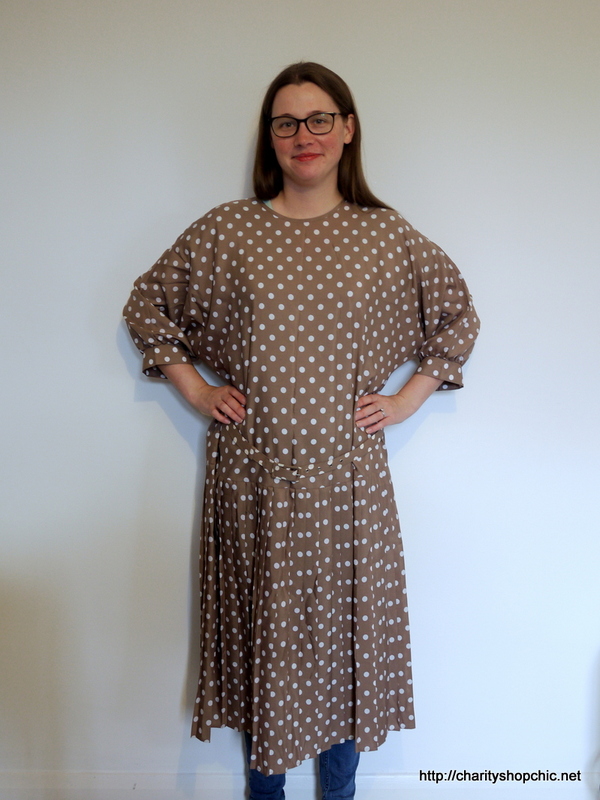 I just couldn’t leave this brown and white polka dot dress in the shop when I saw it (bought at the same time as the grey lace one in Whitby Scope, £4.95). So the task for this dress became turning something very ordinary into something chic, with a hint of polo spectator. 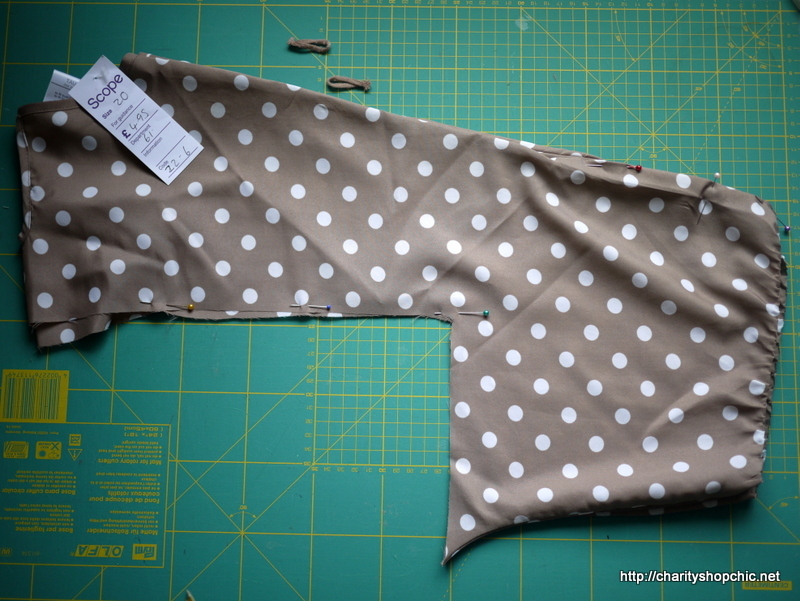 I decided on a simple halter design (as I had plenty of material for ties) and started cutting. 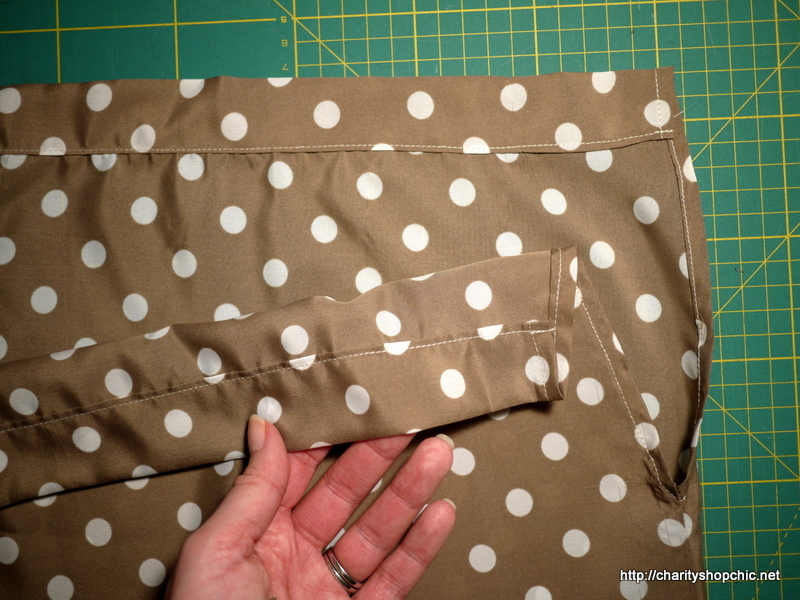 Folding the piece in half, I measured myself waist to collarbone and cut straight up from the side seams until I hit that level (plus a wide seam allowance). Then turned 90 degrees along the new neckline. Luckily this was below the button opening at the centre back as the dress originally had a dropped waist. 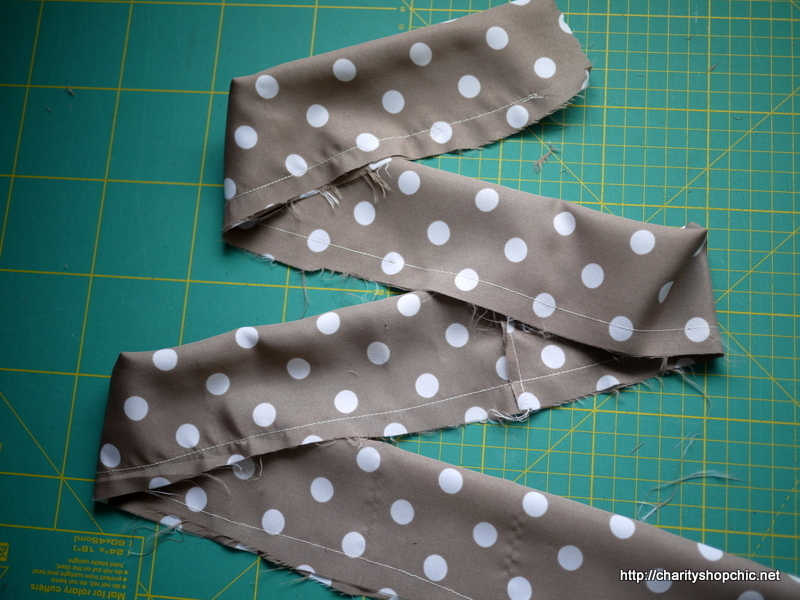 From the remaining material, I cut some long strips to make into a tie. It was simply a long thin tube turned inside out. I cut the ends at 45 degrees because I thought it suggested ribbon. To finish the ends of the tie, I just folded the raw ends in, pressed and topstitched. 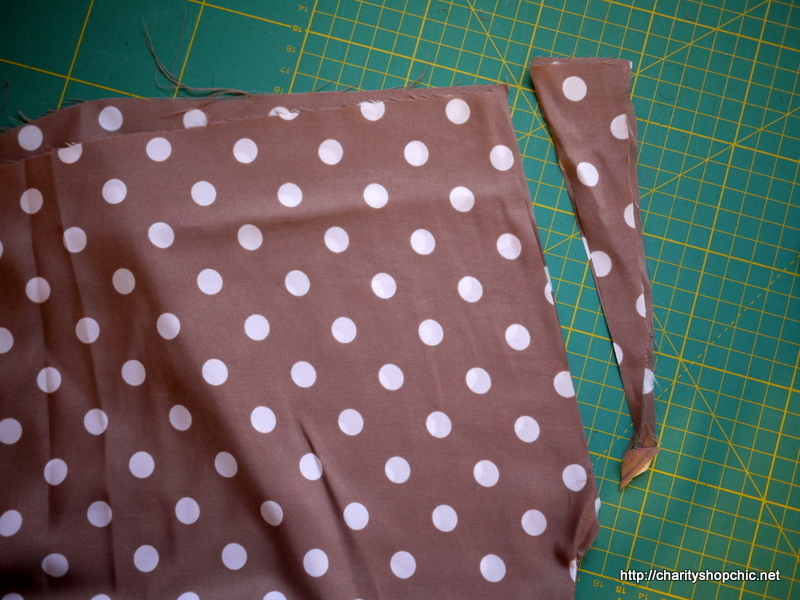 To make armholes, I cut wedges out of the front and back. After finishing the armhole edges (simply by turning under twice and topstitching) I folded the neck edges down in a wide hem to make a space for the tie. 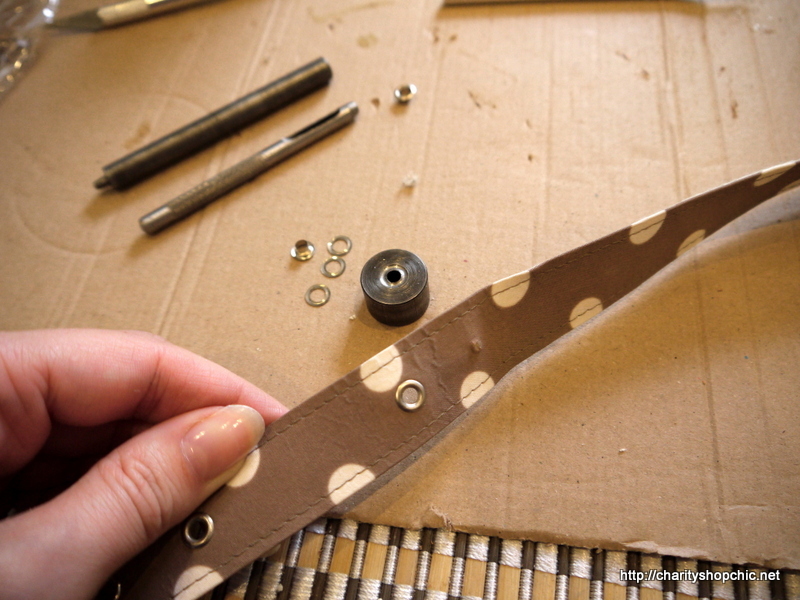 I had to add extra holes to the belt as it was too big. This was my first time using eyelets! It’s actually easier than I thought. 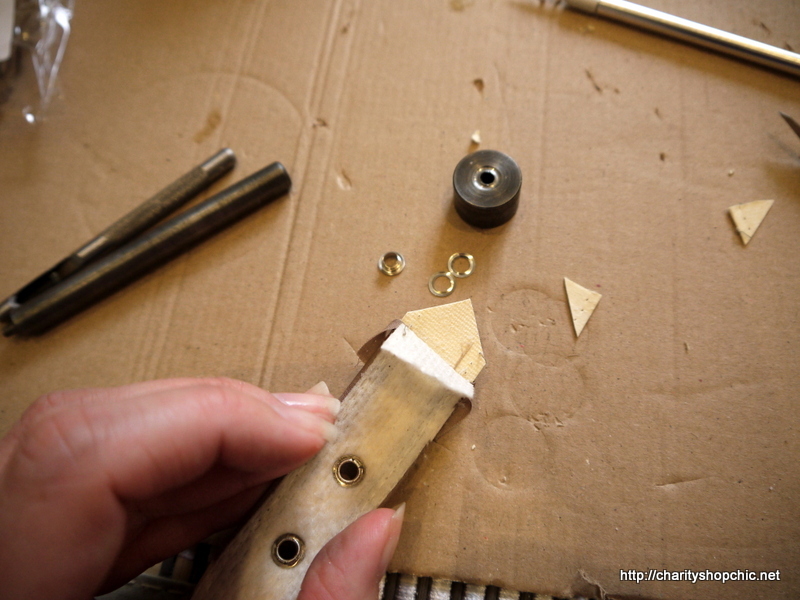 You just mark where you want the hole, punch a hole there, insert the two pieces of the eyelet, place the assembly on the small round piece of metal, then bang the other punch down with a hammer. Et voila! 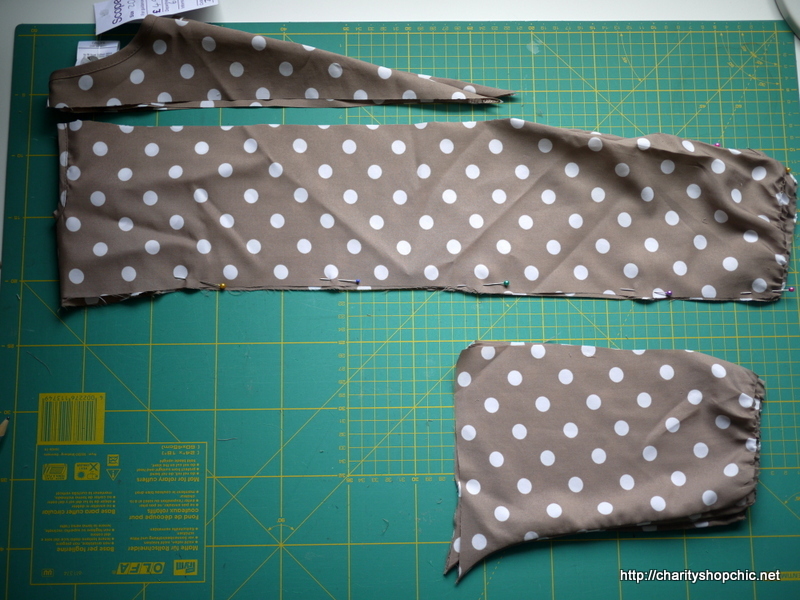 I cut the ends of the belt off into a point before sewing the material back on. In practice the end is slightly short, because I wanted to cut off all the existing eyelets, or it would have been a bit awkward. It works, though! 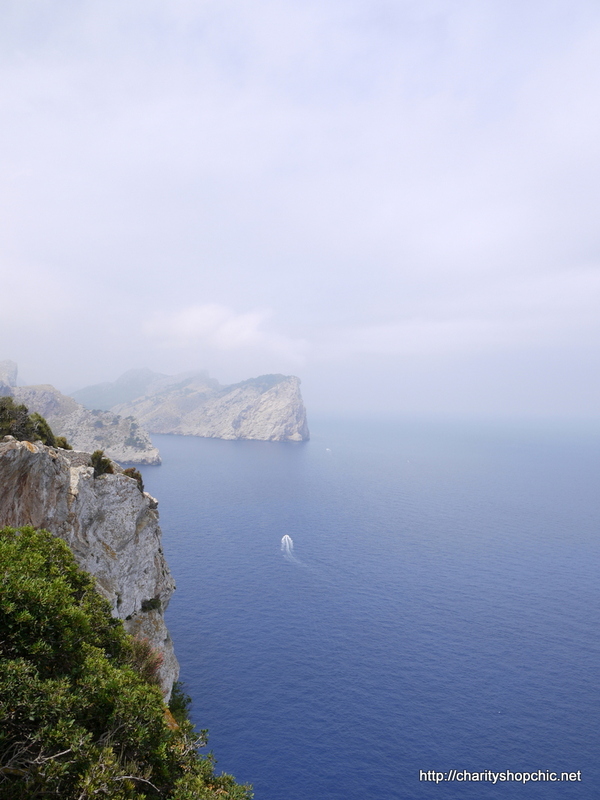 For our last full day in Majorca we drove up to Cap de Formentor on the other side of the island. The drive up there over the mountains and the views from the top are equally spectacular. The dress somehow ended up at the perfect skirt length, though the top part is perhaps a little blousy. I tried tying the tie tighter, but the armholes were not long enough to let the neckline go much higher. My only slight quibble is that the back is a little bunched up when worn, as I obviously adjust the waist size with the belt, and this makes the pleats fall a bit strangely at the back. But it’s not a deal breaker. 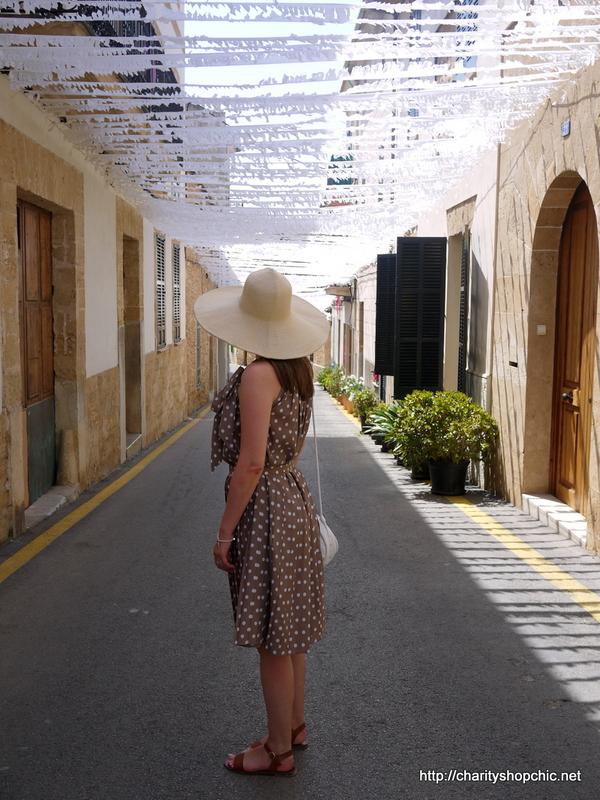 We also walked around Alcudia – the old town – which is stunning! 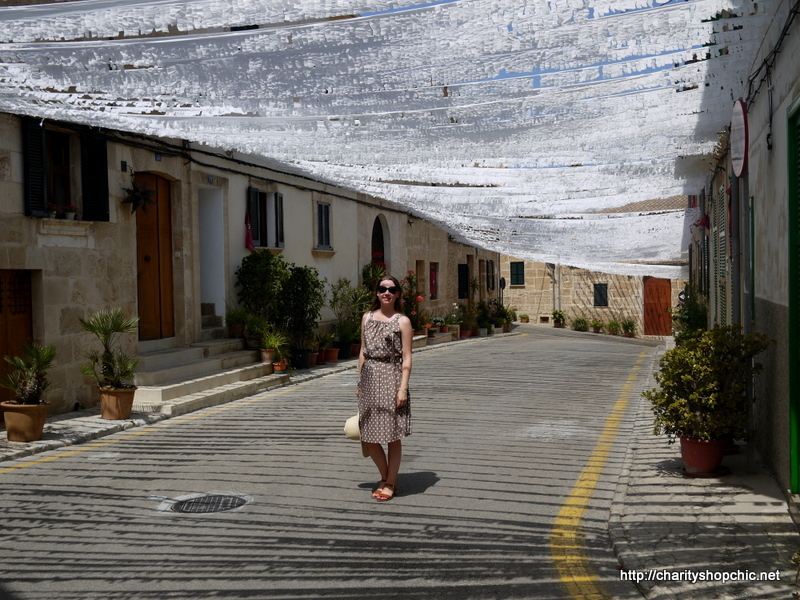 All the streets were decked out in white streamers which provided some shade as we were walking around. And the houses all have dark green shutters. Most houses along the narrow streets had beautiful plants outside, adding to the atmosphere. It looks beautiful! You made it beautiful! I like the extra bunching- just makes it a bit cooler! Haha, thank you! Yes, it was dated, but so glad I managed to snap it up! I absolutely love this. 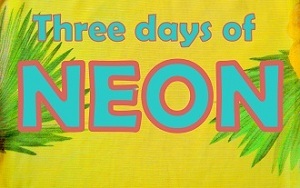 Who could resist that fabric with its movie connotations? Did you keep a strip of fabric to tie round your hat? Would that be naff? Anyway, your dress is very elegant and the setting is glorious. Do you know what, when I made this I was originally intending to wear it for a wedding, and I even made a small hat with a brown polka dot ribbon trim to go with it. But I went with something else for the wedding so the hat got forgotten. Maybe I should dig it out! Amazing transformation and I really don’t think the bunching is an issue! 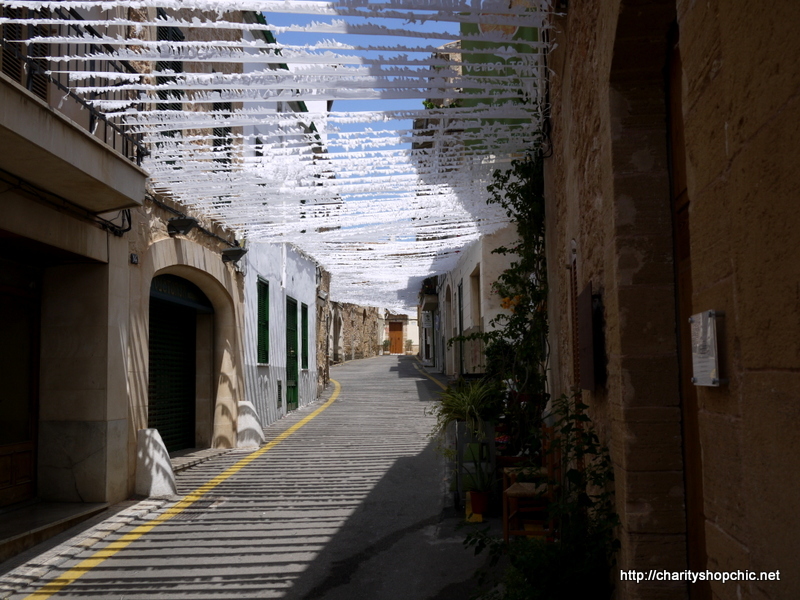 Alcudia looks beautiful – especially with those streamers. Thanks for reading, JaneyB! 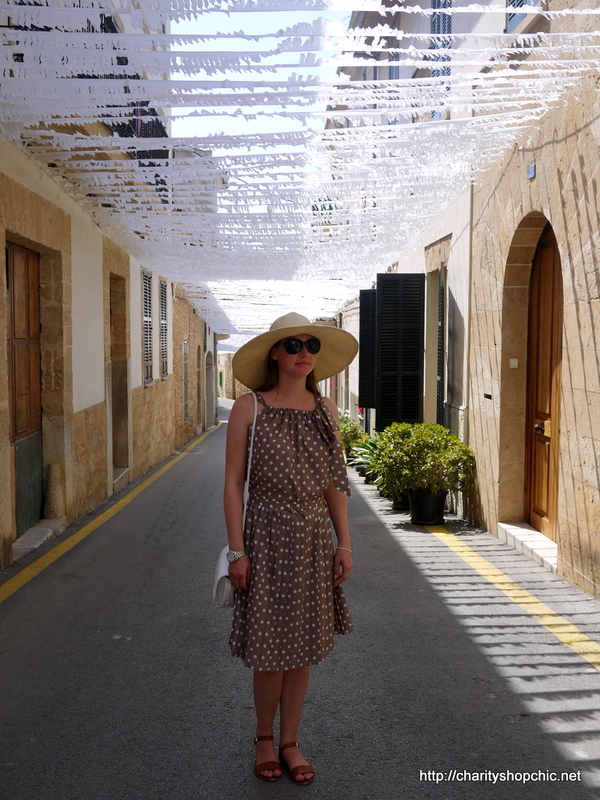 Alcudia is indeed a must-visit – maybe when the weather is a bit cooler! Thanks Jules – I am quite pleased with it! Thank you so much, horopito! Thanks for stopping by! This dress is stunning! I’m always in awe of your transformations! Thanks Teresa, I really appreciate your support! Impressed – you made brown polyester chic! Particularly like the creativity in transforming the top part of the original dress. Inspired. Hi Stephanie, you should try this! Such a simple transformation. Happy sewing! Another clever refashion. The result is stunning! Thank you so much for commenting, Hélène! as soon as i saw the before, i knew what you were going to make! really lovely! Stunning as ever… a shame about the bunching but it still looks great! 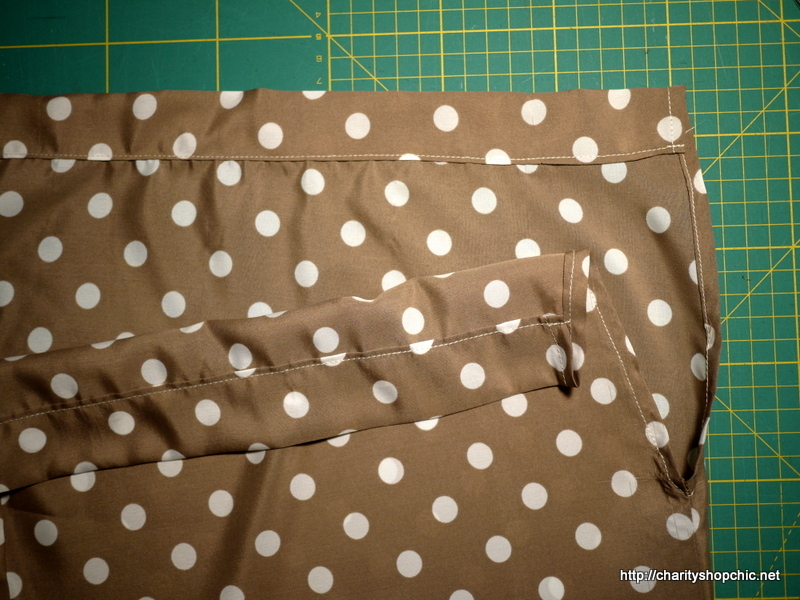 I have always loved brown with white polka dots! I really like what you refashioned! 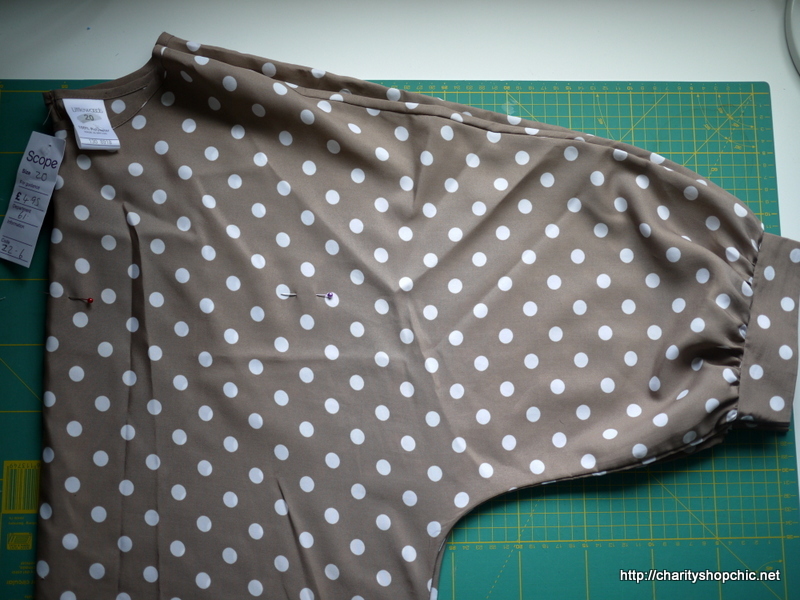 Hi Aileen, polka dots are not usually my thing but I really liked this colourway too! Thanks for commenting! I have to confess, I love polyester. It’s brilliant to work with, does not fray, is incredibly easy to maintain, doesn’t require ironing and higher quality polyester will last you ages. Hi Kasia, I completely agree… Something being polyester definitely doesn’t put me off! All polyesters are not created equal though – some have much better crease-resistant properties than others, and some certainly seem to be more breathable. Thanks for reading! You know, I don’t think that the top part is too blousy at all. I think it’s a nice contrast to the pleats below it. Great job! Thanks Nathalie – yes, the inspiration piece is so lovely! Another super re-do, well done!! I have forever and always loved that dress Julia wears to the Polo match. :-D Excellent salvage! I LOVE this one! It is extremely flattering on you, and even better with the adorable hat! 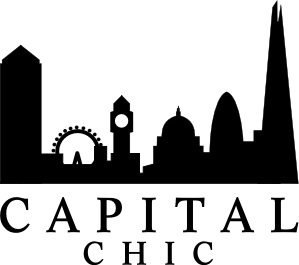 Amazing, you are so creative, I buy clothes from charity shops that either fit or need minor alterations but having the imagination to create a totally different look is awesome. 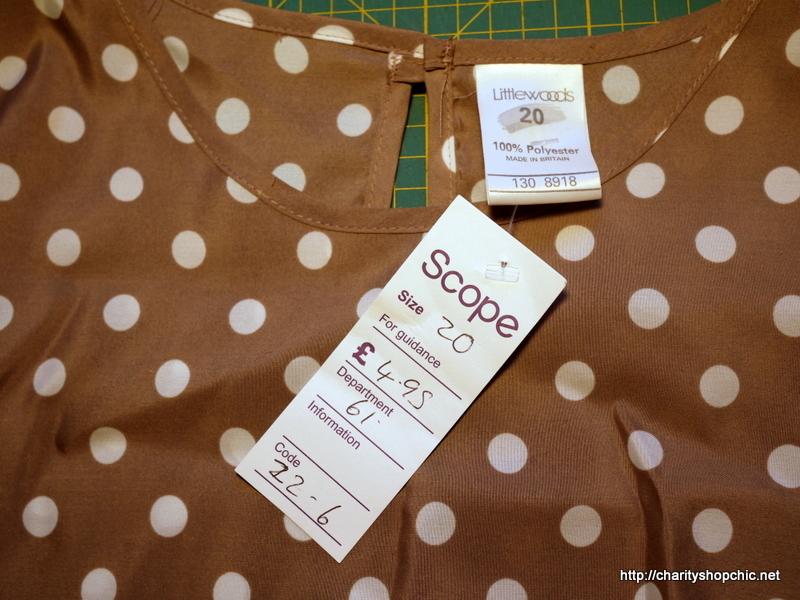 Thanks Lynsey, so glad to hear you are working on your own charity shop finds! Happy sewing! A brilliant transformation and you look very chic! Ah, well now you know what to do! 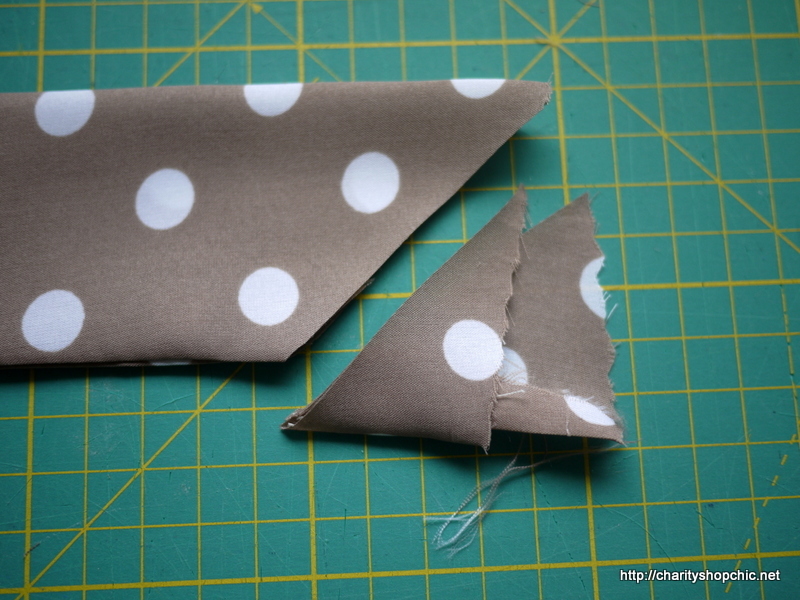 Thanks for commenting and happy sewing! Not technically polka dots but same general idea: http://bit.ly/2bTRqNY I think it’s very current. And I agree, the blousy-ness works for me, both in the front and back. Thumbs up! I love polka dots! You look very fancy too :) I think it could also look very “summery” (is that a word? sorry, English is not my mother tongue) and spicy with with some brights accesories, for instance a green lime belt or something. Hi Dolores, summery is indeed a word! Thanks for reading, I’m glad you liked the dress! You really are amazing. That is one heck of a transformation!!! Fabulous. Haha, thank you Lulu! This one was a lot of fun to make and wear! I love brown and white together and polka dots, and Julia Roberts in that dress. So I find this irresistible. It is a clever make – I would have tried to recreate it but that would have been a nightmare. This is beautifully simple and manages to be understated and cool. Great work, as ever. Oh I always loved this outfit in the film. I had something a little similar at the time as did my mum! I think you’ve done an amazing job and the bunching does not present an issue for me! 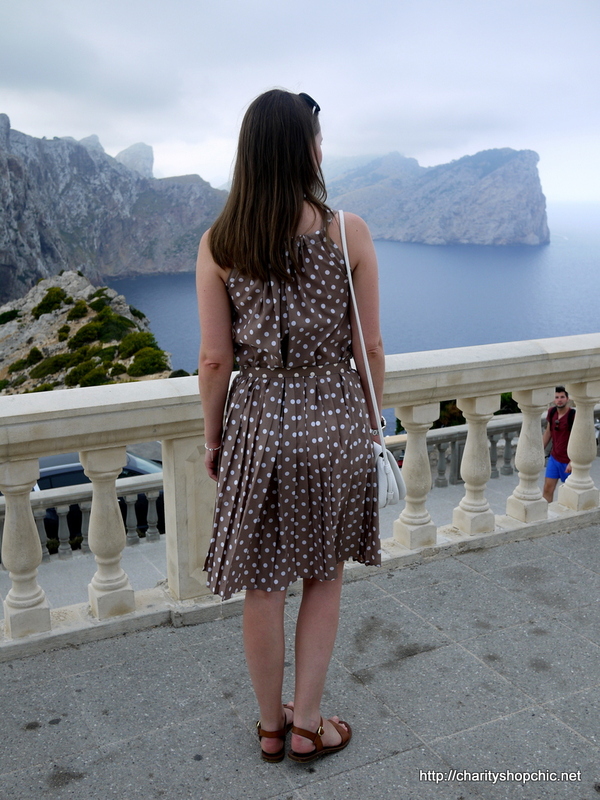 A dress on holiday is so much more stylish than the uniform of cut off shorts, vest top and flip flops, and if its one you’ ve transformed yourself from a fat lady frock what could be better? 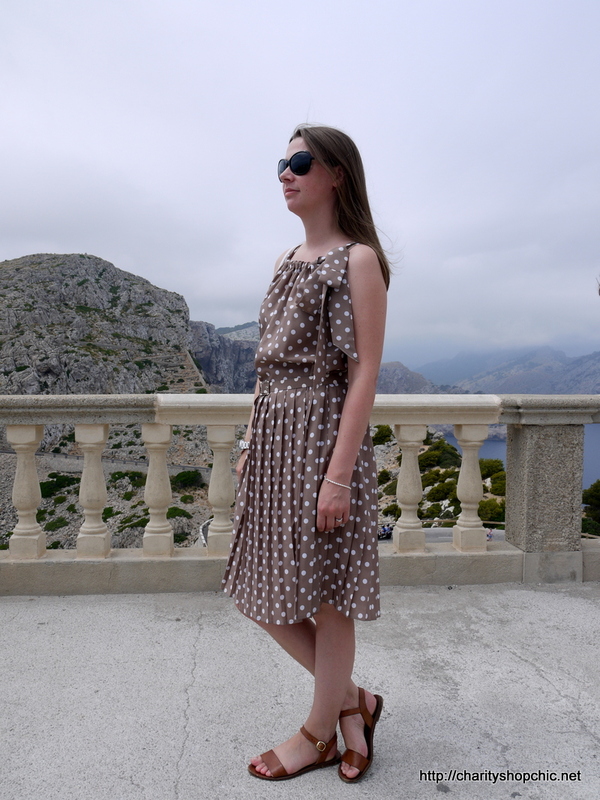 I totally agree, I’m much happier in summer dresses and sandals over sportswear on holiday as that fits with my usual style, but I guess most people just like to be comfortable when it’s hot. Thanks for commenting! Wow, you did a beautiful job. It certainly looks very “Pretty Woman” and you look lovely. Thank you so much, Sandra! You are so kind to leave me a comment. Very nice refashion, love polka dots too ! Thank you, Wendy! Polka dots are not normally my thing but I just couldn’t resist this one. 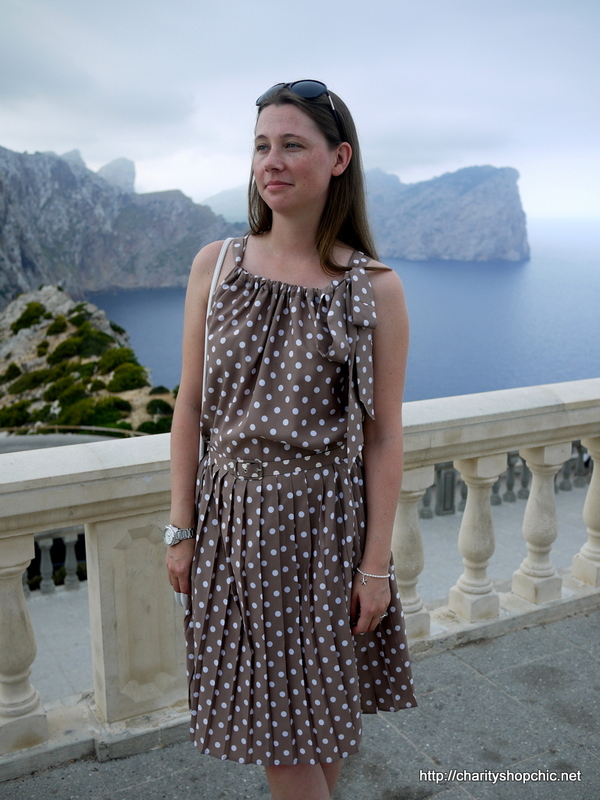 As I’m new to blogging I have just come across your blog, and the transformation of this dress is incredible! Not sure I’d ever have the skills to do it myself though!! Greetings from California! 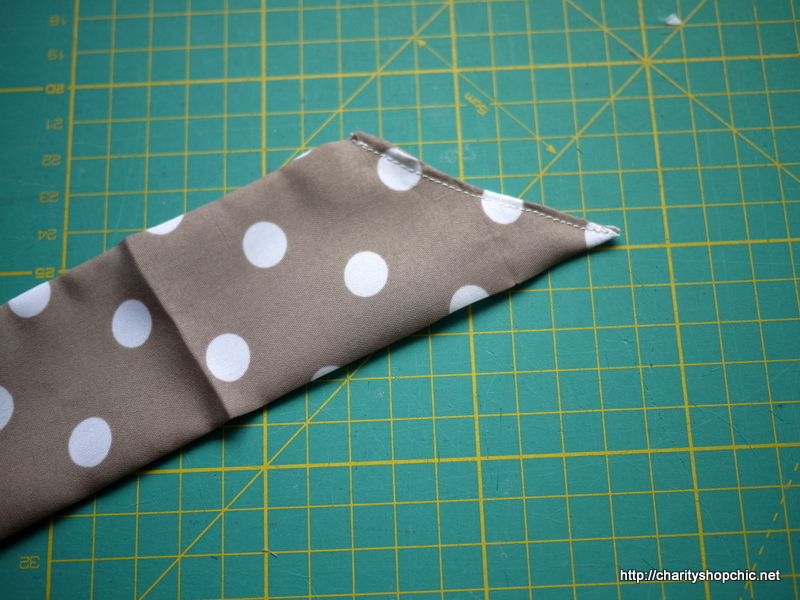 Your sewing of charity shop finds is fabulous! You are a very talented seamstress. I’m so glad to have found you through Fiona at Dairy of a Chain Stitcher’s Indie Pattern Roundup. I can’t wait to see more of your blog! 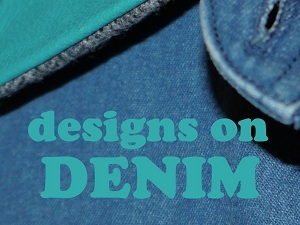 Just found your blog through an article in Simply Sewing by Rosie Martin. I love your ingenuity and imagination! I’m lucky to have a charity shop in my local town that often have an “everything for a £1” to make room for new stock. I have tons (not much of an exaggeration I assure you) of clothes made of gorgeous fabric or striking designs, sometimes luckily both, in my fabric stash just awaiting inspiration.